The National Civil Defense General Staff decreed today the phase of alarm because of Hurricane Sandy for the eastern provinces of Guantánamo, Santiago de Cuba, Granma, Holguin and Las Tunas. Note No.3 about the meteorogical phenomenon also includes Nuevitas, Guaimaro, Santa Cruz del Sur and Najasa municipalities, in Camaguey province. The note released by the afternoon National TV News program indicated to keep the information phase for the provinces of Ciego e Avila, Sancti Spiritus and Villa Clara and the alert phase in the remaining municipalities in Camaguey. State economic and social bodies and institutions and the population in general must comply with discipline the measures taken and remain on alert and follow carefully the reports from the Meteorology Institute and the directions from the Civil Defense. In a meeting at the headquarters of the National Defense Council for Disaster Situations, Chief of the National Civil Defense General Staff, Gen. Ramon Pardo, urged authorities and the people to follow the directions given by the Meteorology Institute and the Civil Defense to protect the population and their assets, as well as the countryâ�Ös economy. "Noting can be left at risk; we have warned early enough in order to take all necessary measures," he said. At the moment, garbage and rubble collection, unclogging of drain systems, tree pruning, as well as efforts to protect the cattle, agricultural means and crops have intensified in eastern provinces. 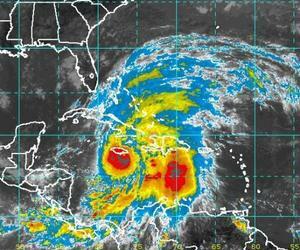 Hurricane Sandy is expected to hit Cuban territory at a point between Santiago de Cuba and Granma, about 23:00 local time (03:00 GMT) today and move away tomorrow at 05:00 (09:00GMT) through the north coast of eastern Cuba, according to forecasts.